The E. Tautz line of handmade, ready-to-wear clothes designed by Norton & Sons is about to go into London stores. 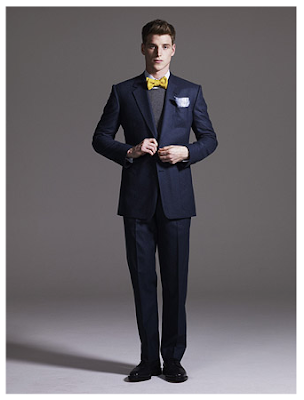 In fact, Matches selected its pieces yesterday from the Savile Row shop and their choices will be delivered on Monday. Harrods, the only other UK store to carry Tautz, will be putting out their selection in early September. When I popped into Norton & Sons, the rail was all out of order, as was the look book. And it was all Matches’ fault. Still, the singular aesthetic of the Spring/Summer 10 collection, very similar in thrust to the first one (A/W 09), is not hard to discern. And you can see it all on the Tautz site, in order, here. Everyone at Nortons has a hand in the designs of Tautz, but it is Patrick Grant’s overall control that maintains the singular aesthetic. Knit bowties, luxurious knitted sweaters, unlined jackets and big round collars. Usually paired with knee-length socks and black lace-ups. For me, the socks and shoes are key. Like the shorts-suits, they reflect the psychology of the collection rather than aiming for heavy retail. The themes are traditional, quirky, of their time and consistent throughout. 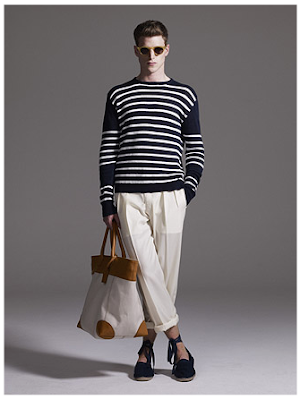 I like the Breton sweater (above) but I’m not going to wear it with the shades and the beribboned espadilles. It doesn’t matter: the sweater itself has the psychology of the rest of the collection built in, albeit more subtly. “The stripes on a traditional Breton sweater shouldn’t break into the neckline,” says Grant. “The first one should start just below, right across the chest. Jerseys, and those made by machine, rarely achieve this as they are made from just a single pattern.” It’s easy if the piece is all hand-knitted (and easy to control if it’s all done in the UK). Then there’s a small, contemporary twist: sections taken out of the stripes in that sweater. In the jackets, the sophistication of the unlined construction – that would look odd with a single breast but hangs together much better with a double. The trousers reflect that as well. 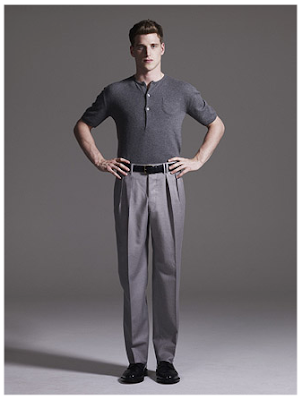 Both them and the shorts are based on original designs from the early twentieth century that were worn to play tennis. The trousers (above) had side tabs as well as belt loops – and two loops on the immediate right of the buckle (perhaps a clue to our previous discussion about which way to wear your belt?). Those design elements have been retained while the construction elsewhere is modernised. I find Tautz fascinating because it’s ready-to-wear with the best of tailoring built in. From a craft perspective there is also an endless list of quirks and quality points I could bring up. 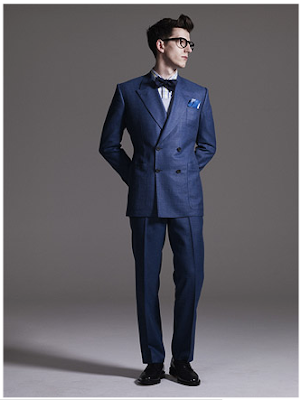 Have a look when it goes into stores – broadly Harrods has the tailoring and Matches the casual wear. You can follow the discussion on E Tautz goes retail on Monday by entering your email address in the box below. You will then receive an email every time a new comment is added. These will also contain a link to a page where you can stop the alerts, and remove all of your related data from the site. those trousers you can see your underwear through (or is it pocket-bags ?) will be a hard sell. The third picture shows an exceptionally nice outfit, though I never wear shirts like that. Let’s hope that E Tautz is successful. I am new to your blog but have read your experiences with your Hong Kong tailor with great interest. I really like the double-breated suit by E Tautz and was wondering to what extent it is advisable to show such pictures of suits you like to tailors. I love the navy suit with yellow bow tie. Very sharp with just enough personality to work in almost any setting.